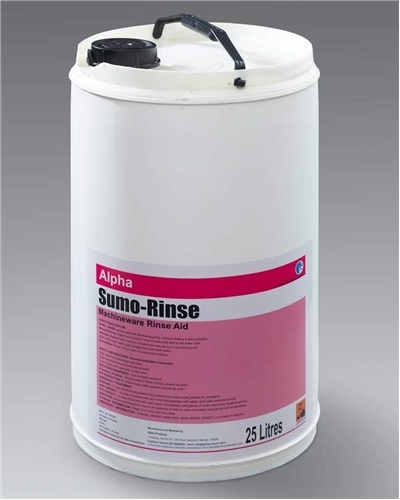 SUMO RINSE is a clear low—foaming rinse aid with excellent wetting and drainage that leaves surfaces spot free and sparkling. Sumo- Rinse can be used with the dosing pump, manual dosing is also possible. Manual Dosing: Dilute 1ml to 2ml in 1 liter of water and add to the water tank. Automatic Dosing: Follow machine manufacturer’s instructions or use dosing pump. After every major wash cycle change the wash tank water. Sumo-Rinse should not be used on aluminum surfaces. Pack Size : 25 Liters.